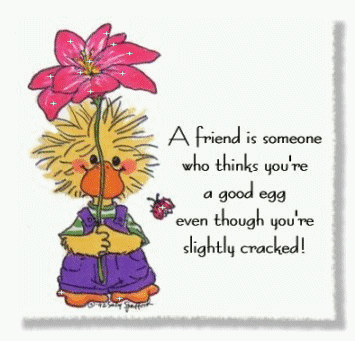 Love to receive comments…let me know your thoughts… *s*.. This is Beatrice. 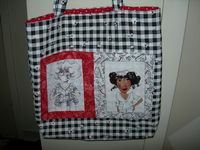 She was started some time ago but put aside for other crafts. 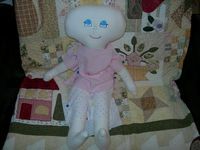 Now Beatrice is waiting patiently for blonde hair, new clothes and Madeline to give her loves. I’m ready to finish her wishes. I was home on my own which isn’t an entirely nice thing but it was a perfectly productive sewing weekend for a change. Nobody at home..nobody dropped by…just the perfect do what you want weekend. 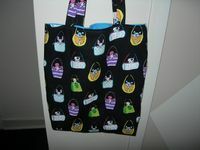 All total I made 7 tote bags. 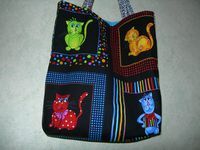 I made 3 with the Nifty Nurses fabric I had used previously to make pouches, 2 with the Cool Cats and 2 with the Dogs in Baskets. I had quite the production line going. Seven started with the number of each colour I decided I would cut out, and then the production began. Cut…cut…cut..cut..etc… sew sides…sew sides..sew sides etc. 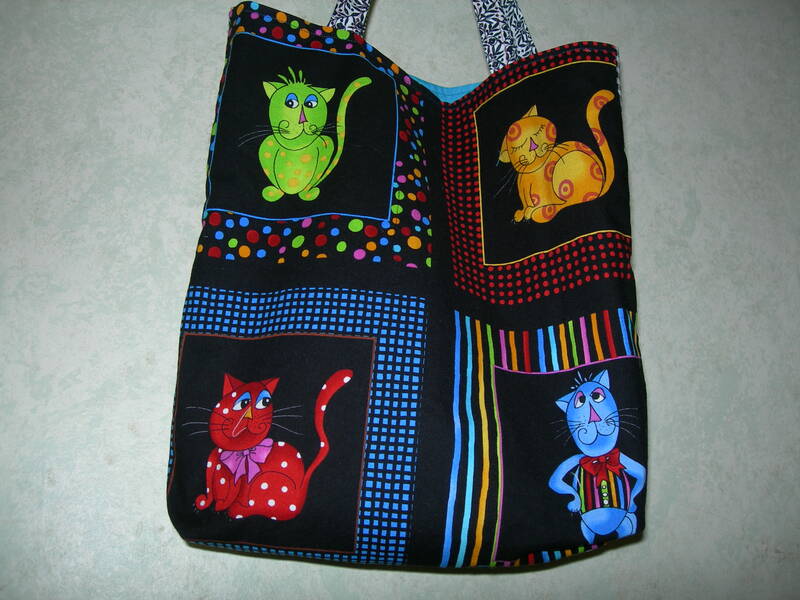 …sew lining x 7…cut and sew handles.. x 7 etc. and I was determined not to stop until they were done…except for a trip to Fabricland for more black thread (fortunately…. or not?? they are 3 minutes down the road). But first Friday night started with 2 great bags with zippers. 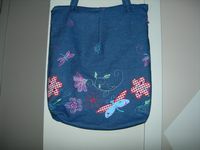 I loved the look of the blue denim with embroidery fabric I purchased on Friday night. The lining is a great, pink paisley material. I was very pleased with it. 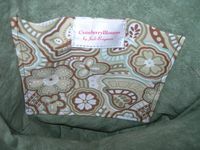 Then I made the smaller corduroy purse however, I have to admit I still have the handles to put on. I was so enthusiastic about starting the totes on Saturday that I decided to cheat and not finish. 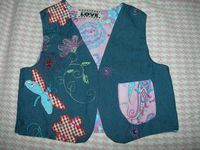 THEN…because I loved the blue denim I had all kinds of ideas of what to do with it…so…I started out by making Madeline a vest with it on Sunday morning. It was so fun figuring out the placement of the embroidery which I had decided I was not going to use on the whole vest. I cut some of it out of the fabric and zig-zagged it on the back. Then I made a little skirt using the pink paisley as a border on the bottom of the skirt. I used the same paisly to line the vest. 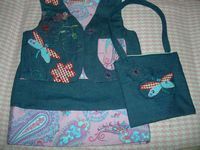 I couldn’t stop until I had made a little zipper bag onto which I had zig-zagged an embroidered dragonfly and star cut from the material. I attached a single strap. Its adorable. Backtracking again to Thursday night while shopping for some yarn to crochet a poncho for Madeline, I happened upon a great bargain on 2 little tops for her. I chose the colours that would go with the poncho, well it happens that one of them will go perfect with the vest and skirt outfit. I’m so excited to get a picture of it and to dress her up. I sure hope its her size. I did call Robyn to ask her for Madeline’s waist size and length from waist to knee. Such little figures for a 3 year old. When I am able to take pics I’ll write more about the poncho…. the colour is called Rustic Rouge and it is making an incredibly nice pattern as the colours change….but….mmmmmm dinner’s ready. Pork chops and new potatoes under cover in the oven with cream of mushroom soup to cover…mixed veggies are boiling on the stove…see you next time! I couldn’t wait to get home tonight. 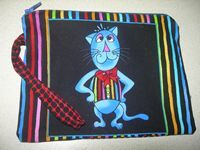 I had been waiting for the chance to play around with some of my new fabrics purchased a couple of weeks ago from ebay. 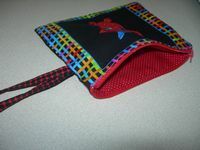 I cut out fabric for pouches and was able to sew up 3 zippered pouches. 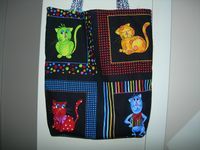 I love the colour of Loralie designs “Cool Cats”. 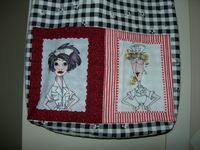 Then I made one pouch with Loralie Designs “Nifty Nurses” . 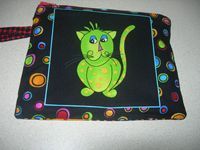 What a great little pouch for a nurse! They were so fun to make. 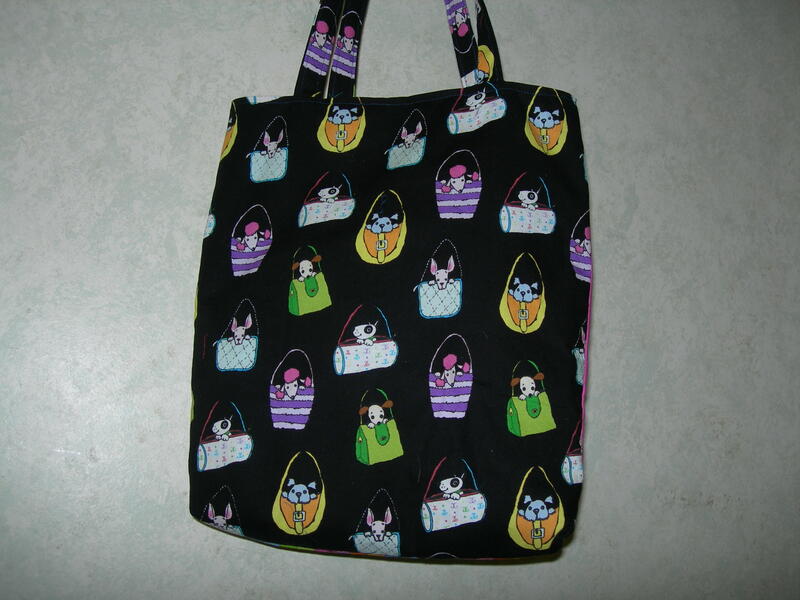 I plan to sew up some totes with these fabrics as well. These pouches may find themselves at my etsy shop as well unless they get nabbed by people at work first. It has been busy with Son #2 coming back from B.C. and busy weekends that this weekend I’m home and actually had some time to sew. I sat down and sketched a design and then went right at it. 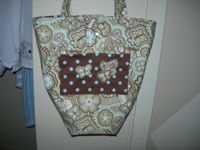 The main fabric has a delightful chocolate brown, aqua (which go soooo nice together) and green colours. 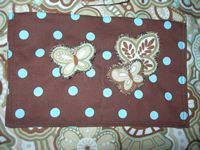 The bottom is narrow but wide and is Robert Kaufman’s Polka Dot Brown, Aqua. There is a little flap with a snap to close it at the top. I really am pleased with it. It will likely go into my etsy shop. 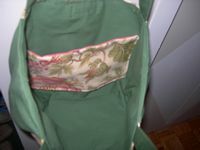 The interior is a mottled green with a pocket in the exterior fabric. 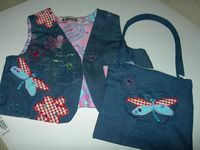 To the outside pocket I have appliqued butterflies from the print and beaded antennas. 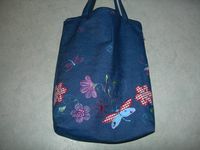 This is the Floral Bag I made last week. It is another all judicreations in that I designed it. I added some little pleats to the top rim at the front and back. 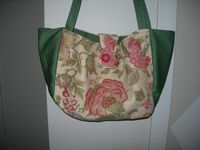 It is made of an upholstery type fabric in florals of rosey red flowers, greens and the background is a cream colour. The sides and interior are white. There is a little matching pocket inside great for a cellphone. 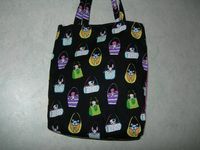 When I designed the bag I wanted the sides to take on part of the front and back of the bag in size. There’s a little snap with a button on the outside to keep the bag closed. It’ll go great with lots of different styles and colours. I thought of adding some beadwork to the outside. You may find it in my etsy store once I’ve decided. Tonight we had a really nice picnic with about 10 couples just down the road at the lake. It was just the perfect afternoon and evening weather wise and friendwise. We had wonderful appetizers, great company and even singing with harmonizing that was great fun. All kinds of old songs were song. Duke, one of their dogs had to put inside because he couldn’t manage the thought of sitting outside while we sang. Silly guy. Marc and I tested a new appetizer we’d never made before. It was a Reuben Dip and we baked it before we left and served it warm with rye party bread. It was fabulous and we had some requests for the recipe. Everything tasted soooo yummy and although we had devoured so much before dinner we all found we’d left some room for dinner. I will share the recipe for the Reuban Dip with you. I’ll post pictures probably tomorrow. Yeummmy! Place into 1-1/2 quart casserole and bake for about 30 minutes at 325F. Serve with party rye bread slices or with crackers. It truly was. Marc’s mother who will be 93 in November hasn’t been able to make the 2-1/2 hour drive to the cottage for about 8 years. She hadn’t even seen Baby Jack yet. What a wonderful weekend it was for her…and for everyone to have her make the drive with Marc’s brother and his wife on Saturday. She came along with her oxygen in tow. We expected she would want to lie down for a little while but no she was set for the day’s events and visits and in fact didn’t go to bed until 9:30! Family and friends came and went during the afternoon to visit her and we had planned a dinner for a possible 13 people which counted up to 21. There was enough food and enough laughter and stories to fill the whole evening. 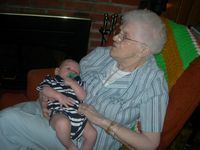 The touchiest moment was when she was introduced to her newest great grandchild, Jack who is almost 3 months old. She held him so tight and they looked at each other…it was a special moment. She didn’t want to give him up and even decided to forego her dinner to sit with him. So precious. Everyone contributed to setting up the table(s) and washing dirty dishes and clearing up. It was such a nice, nice day. Once the place had cleared it was about time to go to bed and everyone slept wonderfully with a nice, fresh breeze off the lake. As we sat for our breakfast more family and then friends stopped by until it was time for me and then the others to make the drive back home. It was a very memorable weekend.